On the coattails of presidential support and possible regulations from the Federal Communications Commission, Net Neutrality makes its way back into public debate. Proponents claim it will keep the internet a level playing field while opponents believe the opposite. One side worries about oppressive corporations while the other is concerned about oppressive government. Not surprisingly, opinions for or against tend to follow political party lines. 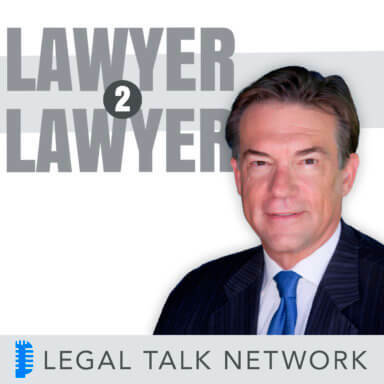 On this episode of Lawyer 2 Lawyer, host J. Craig Williams interviews Chris Fedeli from Judicial Watch and Professor Jonathan Askin from Brooklyn Law School. Together they discuss the meaning of net neutrality, the pros and cons of regulating, and what it takes to keep the internet innovative. Tune in to hear about free market principles, consumer protection, and data packet discrimination. Chris Fedeli is a senior attorney with Judicial Watch where he has litigated multiple cases in state and federal courts concerning election integrity, ballot initiatives and referendums, and government transparency. Prior to joining Judicial Watch, Fedeli was a senior associate at Davis Wright Tremaine in Washington D.C., where he represented clients in communications law litigation and regulatory proceedings. In 2009, the ABA’s Communications Lawyer published Fedeli’s article criticizing the FCC for its net neutrality regulations, which have since been overturned twice by the DC Circuit. Professor Jonathan Askin is a professor at Brooklyn Law School where he teaches technology, telecommunications, and entrepreneurial law and policy. He is also the Founder of the Brooklyn Law Incubator & Policy Clinic, which represents internet, new media, communications and other tech entrepreneurs on business development, policy advocacy, and law reform. During the 2008 Presidential Election, Askin chaired the Internet Governance Working Group for the 2008 Obama Presidential Campaign.